Before we even took these photos, I had already opened the box to check out what was in it and left it to the side. She’s normally pretty good at leaving boxes and things alone until she’s been given the ok to have a snoop. But this time… she was nose in straight away digging out the little rubber Odie from the Garfield themed toys and bringing it to me to play with. A definite favourite, she does love a rubbery textured toy to play with and it’s just the right size for her. 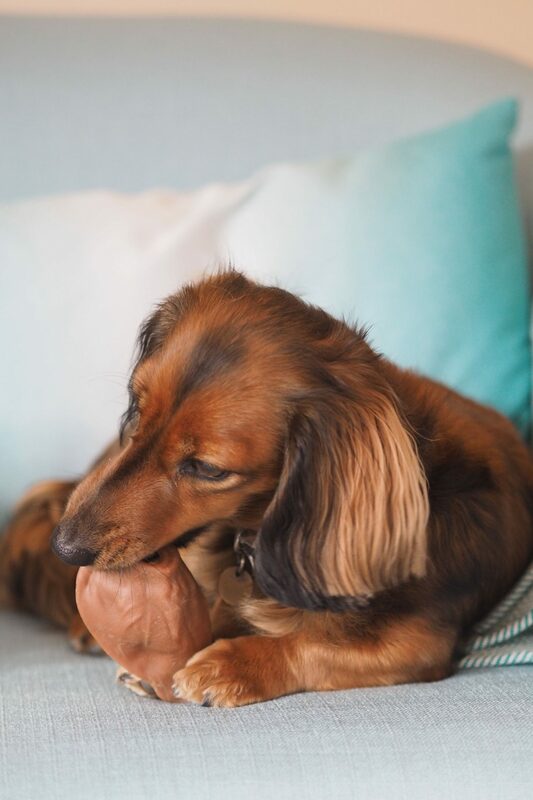 Odie Rubber Toy – A definite favourite, one Monty digs out of her basket every night to play with. Garfield Head Toy with Rope Sides – This is pretty big for Monty but she loves to pounce on it and try and grab the robes to drag it back to us. Wagg Training Treats – Monty loves any sort of meat-based treat so she was pretty over joyed with these. 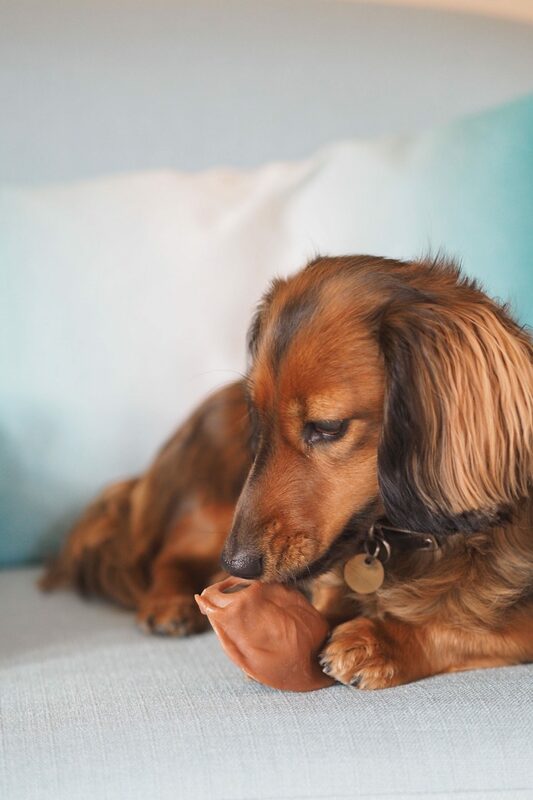 Pigs Ear Toy – Looks like a pigs ear, but actually a vegetable (potato) based chew toy that’s good for teeth. Animal Farm Bauveg Snack – Sweet Potato Based Vegetarian Snack Sticks. Massage Glove for Dogs – I didn’t really realise this was about massage as thought it was more for removing malting hair. Either way, if it means more stroking for Monty… she’s happy. I think once you become a fully fledged crazy dog lady (hello, that would be me) then the idea of spending from £15.80 a month on a box of toys and treats seems totally reasonable. Monty is a dog that has only really started to want to play with toys – she used to be more in favour of humans or other dogs – so it’s quite fun to see her playing with them. Especially when she does it without any encouragement needed. And it never hurts to have a stash of snacks and treats for her! Would you be happy to splash out on a month subscription box for your pooch?! Let me know what you think of this idea – I’d love to know! Oh, and if you want to see more random Monty antics then follow me on snapchat… it’s mostly about the dog over there! My name is @beautyjunkieldn … casual plug there!